Slovenia is without a doubt one of the most underrated places in Europe. It’s a relaxing and beautiful country that’s perfect for sipping a local wine along the Ljublanica River or venturing out into the countryside for adventure. A quaint and gorgeous capital city, sprawling forested hills, imposing Alpine peaks – Slovenia’s got it all. Flying in was incredible. Suddenly we were over row after row of snowcapped mountains. Houses appeared like dots in between and alongside, hugging the edges of dark green forests. The landing announcement came and the snowy peaks were met by sprawling greenery. “Here we go,” I thought. Still so uneasy but so excited for my big adventure. Ljubljana was the first stop on a solo backpacking trip I had planned once classes ended in London. I would be on my own for two weeks before meeting up with my German host family in St. Tropez. I was terrified. The airport shuttle stopped and I didn’t know it was mine until the driver swung open the door and started collapsing the seat in front of me with someone still in it. “Yes, you!” He spoke in exclamation points. He hauled my massive gray backpack out of the trunk and handed me the strap, pointing out how to get to my hostel, which turns out was a block away but still took me 20 frustrating minutes to find. Once I settled in, though, all was fine. Where I stayed: Zeppelin Hostel – It’s a simple and straightforward place, with helpful posters on the walls to help you figure out the bus schedules and potential excursions. There’s a tiny kitchen and small common area with couches and computers. The place was so small that you inevitably met other travelers. Luckily, many of them were also traveling alone and we became fast friends. What I did: Went to the Premier Bar, one of the many bars with endless outdoor seating on the cobbled pedestrian street along the Ljubljanica river. I went with two guys from my hostel and got my first taste of Ljubljana’s totally relaxed and comfortable vibe. 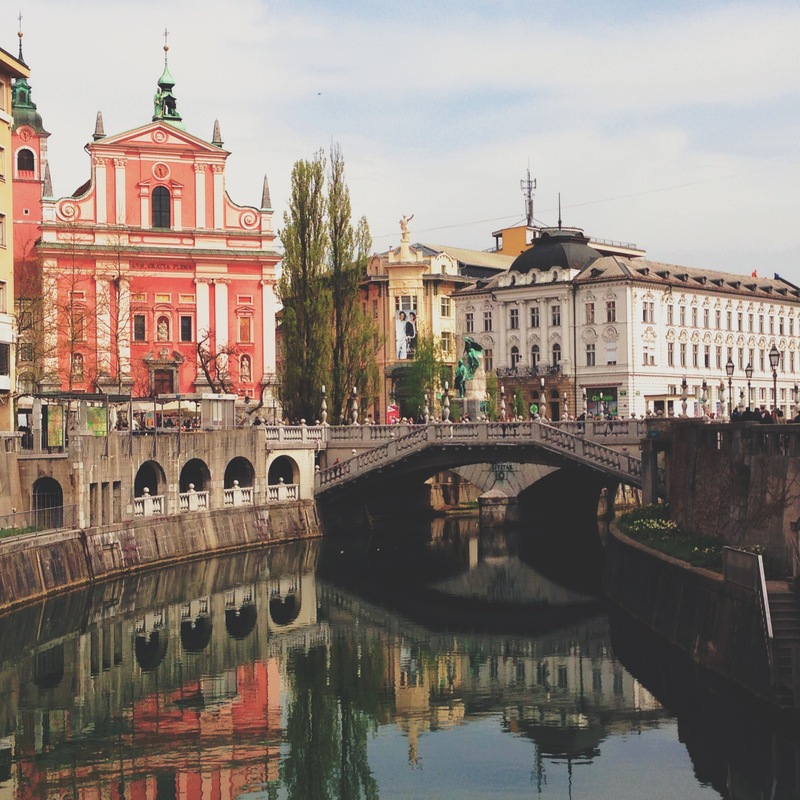 Ljubljana is infinitely charming. 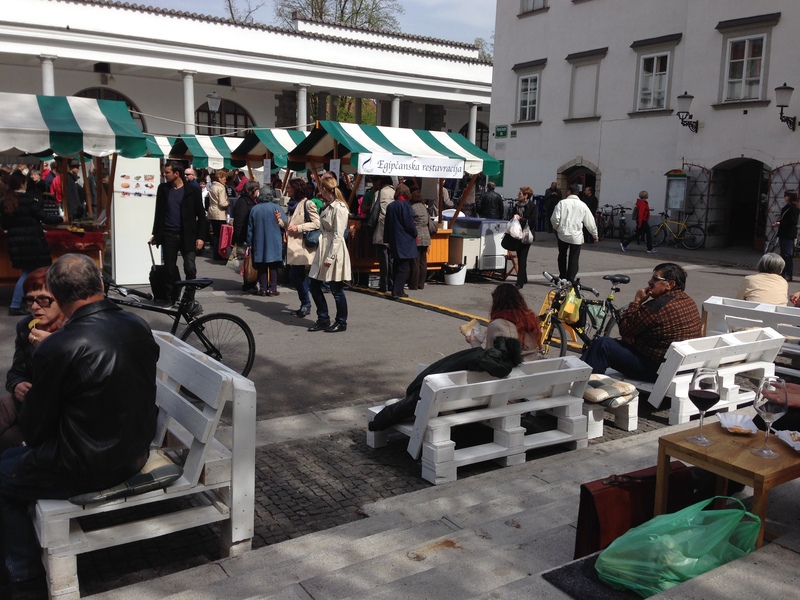 Gorgeous greenery, amazing architecture, lively markets, and relaxing even in the city center. Central Market: I headed back into town to find a bustling food market with vendors from all over Slovenia. It didn’t feel touristy, but each stall conveniently had an English menu and a map pointing to where exactly in the country the food/drink came from and a short descriptive blurb. There were small white tables in between matching benches with individual seat cushions for people to eat at. Behind them were a few rows of steps with small tables and thin gray mats for people to sit on. Music played from loudspeakers and everyone seemed to be having a lovely time. People know how to live here – it was stylish but unpretentious, fun and casual and laid back. Ljubljana Castle: After a long time spent eating and people-watching at the market, I wandered up winding cobblestone streets past shops and cafes and then quaint houses up the steep, green slopes to the castle. The castle itself wasn’t particularly fascinating, but the view was breathtaking. Green forests and hills extended in every direction in and around the small city center, and the snow-capped Alps made a soft appearance in the distance. 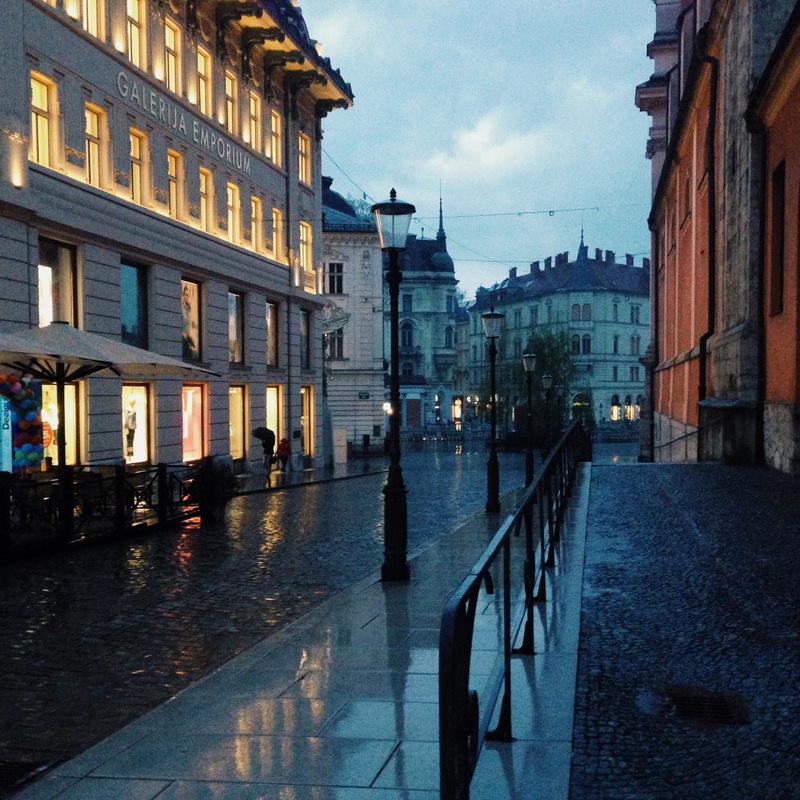 I awoke to pouring rain, so I decided to postpone my excursions and spend another day in lovely Ljubljana. Free Tour: It seems like every city has one of these, and while it’s not technically free (you should tip! ), it’s totally worth it. I met up with some friends from the hostel and during the 2-hour tour we learned so many fascinating facts about the city. One of my favorite things: A couple of years ago, they closed off the old town to cars. But in order to help the elderly and anyone with a heavy load, they have a free golf cart service to help you get around. So sweet! Lunch at a Ribarnica, a seafood restaurant along the Ljubljanica — incredibly cheap. Around 6 Euros each for a full meal, plus 1 Euro each for beer and wine. Not bad! Coffee at Nakavo: I found a coffee shop with rice milk! Ah! Nakavo is the perfect spot for a fun drink and a conversation with one of their super friendly baristas. Metelkova: We decided to go out that night to Metelkova, a former Yugoslavian military barracks/penitentiary that was taken over by the punk & alternative cultural scene. There were lots of street art statues and painted buildings with small, dimly lit doorways leading to bars and clubs. There’s a hostel there in the former penitentiary called Celica — didn’t stay there but peeked in and it seems pretty cool if you’re down for a party vibe. Tivoli Park: My new friend Mark and I got wonderfully lost on the many trails in Tivoli Park, a five minute walk from the city center. We were in good company – everyone there is so outdoorsy and there were lots of couples and families out for a hike. 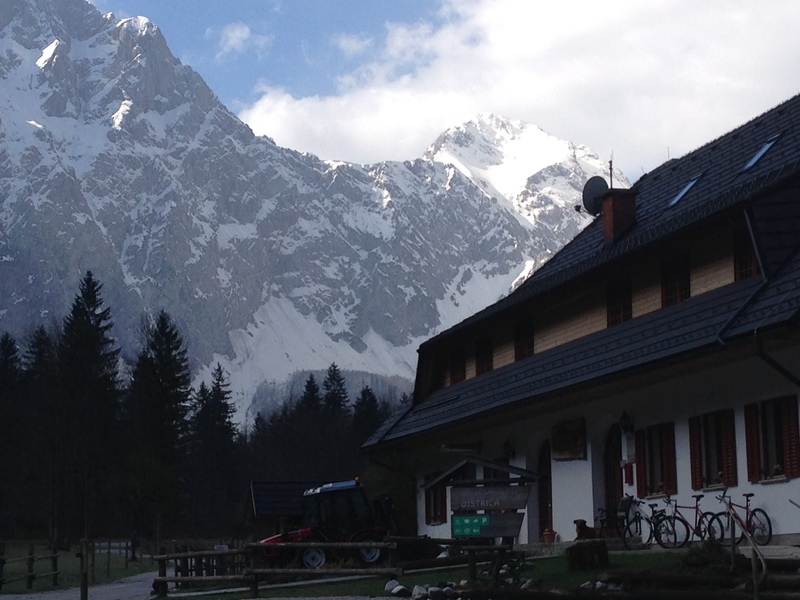 Logarska Dolina: Mark invited me to go along with him to stay on a tourist farm in Logarska Dolina, a valley in the Alps near the Austrian border. BEST DECISION OF MY TRIP. We took a wonderfully scenic bus ride through the Slovenian countryside to Gornji Grad, where we were met by the farm owner’s daughter. She drove us to their guest house, Tourist Farm Lenar, where I was welcomed with blueberry schnapps to a gorgeous suite overlooking the Alps — for 30 Euros a night. Per her suggestion, Mark and I hiked through the snow to a waterfall and came back in time for dinner at the valley’s only restaurant. We each (unexpectedly) had a four course traditional Slovenian meal with wine for 11 Euros each. Unreal. After a bit more exploring and soaking up the peace and beauty of Logarska Dolina, I hopped on a bus from Ljubljana to Lake Bled for the afternoon. 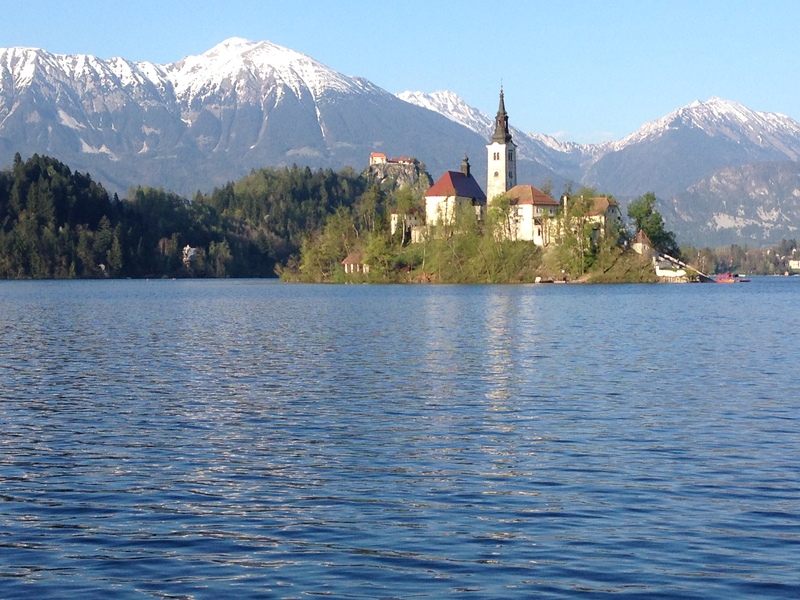 If you go to Slovenia, Lake Bled is a must. It’s just a little over an hour out of the capital, and is a total dream. It’s a large lake surrounded by hills and known for the small island church in the middle. There’s a castle on a cliff on one side and you can see the Alps in the distance. You can rent a canoe or hire a boat to take you to the island, but I opted to take a leisurely walk around the perimeter. On our way around the lake, we met a local who had just landed after paragliding from peak to peak throughout the country. He took the bus with us back to Ljubljana and we all went out for drinks. Perfect day. 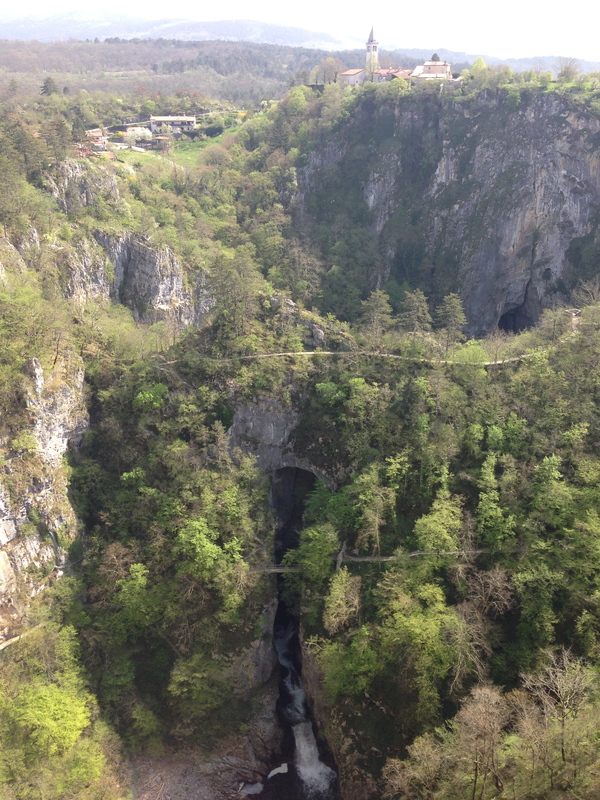 Skocjan Caves is a UNESCO site and is one of the largest underground cave systems in the world. It’s definitely worth a visit but you should be prepared to make a bit of effort to get to and from Ljubljana and be ready for a lot of hiking and stairs on the tour of the caves. It’s pretty damn cool though – I felt like I was in Pirates of the Caribbean (you’ll get it if you go there, I promise).